Japan Association for the Study of Cooperation in Education (JASCE) is an organization to promote research and practice of cooperative and collaborative learning and related educational activities. It also aims to enhance educators’ awareness of the value of cooperation and to expand vital networks among teachers, administrators, educational policy-makers, and researchers. We believe that enriching students’ learning experiences through implementing cooperative and collaborative learning leads to building the foundation of our democratic and symbiotic society. There are many individuals and groups who promote various types of educational theories and practices based on “cooperation” in schools in Japan. 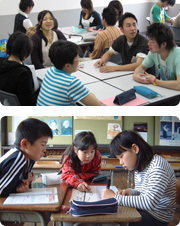 However, until JASCE was established in 2004, there had been few opportunities for them to interact with each other for sharing their ideas and practices. JASCE aims to provide opportunities for those people and organizations to interact with each other to deepen their understandings of cooperation in education and to raise a wave of educational reform towards building our democratic and symbiotic society. In order to achieve our goals, we organize local workshops and national conferences, and publish books, annual journals, and newsletters. Although all of our activities are conducted in Japanese, our members include language teachers and those who speak English. Please e-mail us in English at our office if you are interested in learning more about us and cooperative/collaborative learning in Japan. We also keep our door open for Japanese educators to communicate with foreign educators by working together with the International Association for the Study of Cooperation in Education (IASCE). In tandem with IASCE, we encourage both Japanese and foreign educators to share their experiences and information. ©2016 JASCE. All Right Reserved.